Additionally this expansion offers two additional variants. • In the first variant the players are shareholders who try to get shares of the most successful companies: the companies that supply electricity to the most cities. of their own companies to generate more cash and they are able to buy shares of other players’ companies. Thus, they can also earn a portion of the other players’ successes. If you own all Power Grid maps and the expansion “New Power Plants”, this expansion offers 222 new possibilities to play Power Grid and Power Grid deluxe. 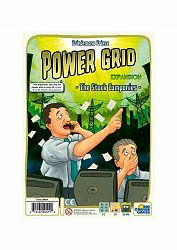 experience from Power Grid and Power Grid Deluxe. The two variants are a little bit closer to the well-known Power Grid experience. We wish you a lot of fun with all three!